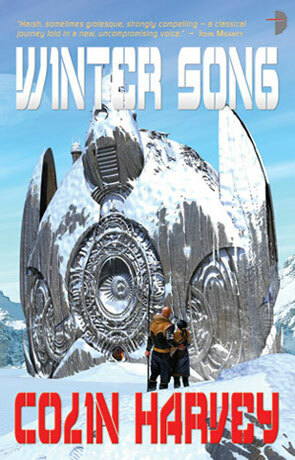 Winters Song is a science fiction novel and has been written by Colin Harvey, published by Angry Robot Books. When Karl Allman's spaceship crashes on an unknown god-forsaken and forgotten planet he finds himself hunted by an ancient, primitive yet powerful race. The descendants of a Viking culture, the indigenous population have reverted to sacrifice, pillage and violence as part of their way of life. When Karl falls in love with an outcast Girl his only hope is to get off the nightmare of a planet. The planet (called Isheimur) is a cold, unforgiving and very inhospitable place, and the people even harsher. Rather than concentrate on an alien world with an alien culture, Winters Song is very much a story of Human nature and the de-volution of a society when necessity presents itself. Colin Harvey has managed to create a compelling story of humanities survival in hostile conditions, with well realised, interesting characters that you can really relate to, add to that a number of refreshingly surprising twists and turns and you get a very rewarding novel that I have no hesitation in reccomending. Written on 1st February 2010 by Ant.